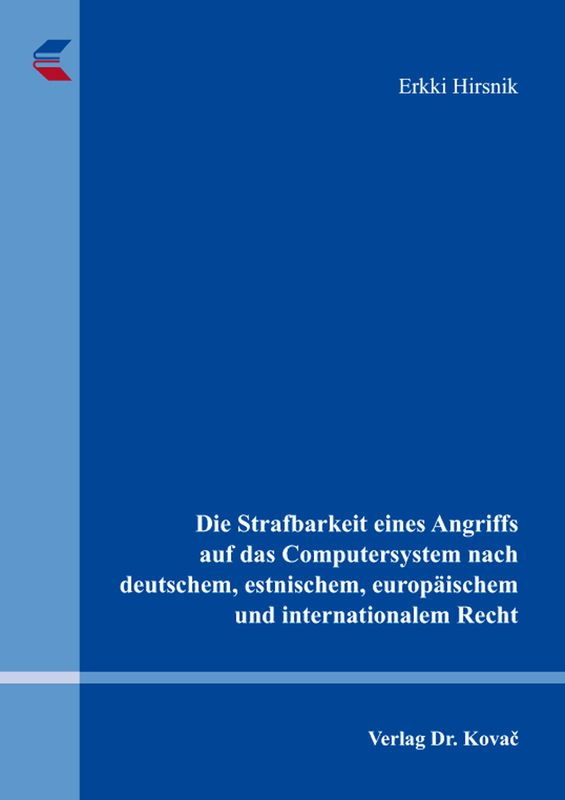 Die Strafbarkeit eines Angriffs auf das Computersystem nach deutschem, estnischem, europäischem und internationalem Recht. Doktorarbeit (english) von Erkki Hirsnik, Verlag Dr. Kovač 2013, 306 S.
Even though it is complex to define the term „computer crime“ or „cybercrime“, there is an overwhelming consensus that this phenomenon is gaining more and more importance in criminal justice practice. The present work concentrates on one particular part of the computer crime –attacks against computer systems or computer data. The parties of the Convention on Cybercrime of the Council of Europe from 23.11.2001 and the member states of the European Union must criminalize these kinds of attacks. It is examined to what extent the German and the Estonian legislators have complied with this obligation. Concerning the illegal access to the computer system or to computer data, both law-makers have, by and large, implemented the international requirements. However, some shortcomings exist, which, in some situations, could lead to unsatisfactory results. To avoid over-criminalisation, the legislators in both counties have, thankfully decided, that only such objects deserve criminal protection, which are protected against the illegal access. As, according to the German Criminal Code, the illegal interception is punishable, it is not the case in Estonia, which is why the Estonian law needs to be improved in this respect. The so-called “virtual damage of property“ is culpable both in Germany and in Estonia, whereas the respective Estonian criminal provision is, on one hand – regarding the criminal actions – too broad, and on the ohter – concerning the objects of the crime – too narrow. Computer sabotage is also punishable in both countries. The respective German regulation is in part being critisised as too narrow. Such criticism must be rejected because the restrictive elements of the norm only exclude the acts that should anyhow not be punishable. When the German legislator adopted the criminal provision regarding the preparation of the cybercrime act, this provision encountered major criticism. There was a fear that alongside real threats, some necessary and positive acts will also be accidentally declared punishable. These allegations are unfounded since the paragraph can be interpreted in a way that only real infringements are encompassed. The situation in Estonia is different as the respective criminal provision is extremely broad and can therefore be interpreted practically without any limits.